This Pancetta-Wrapped Kimchi Pork Roulade has been a long time coming. When I was living in Atlanta, my friend Seung Hee treated me to my first Korean spa trip. I wasn’t sure what to expect – all I knew was that I needed to feel ‘comfortable’. If you’re not familiar with a Korean spa, essentially there’s a strictly male section, a strictly female section, and then a common area for everyone. The gender designated spaces are the treatment areas; while the common area is composed of various saunas for both men and women. There’s actually a great and rather hilarious video of Conan O’Brien and Steven Yeun at a Korean spa – the responses are comedic, but the actual treatments they endure are real. After our relaxing rejuvenating spa day, we went out for Korean BBQ. This particular restaurant had an angled grill plate in the center of the table; and what I remembered most was the pork belly that was placed at the top of the grill and the kimchi at the bottom – so when the fat rendered from the pork it dripped down to the kimchi below and gave it the most incredible flavor… like eyes rolling in the back of your head, kind of flavor! I wanted to capture that entire dinning experience in one easy dish. Originally my thought was to roll the kimchi in a giant slab of pork belly. 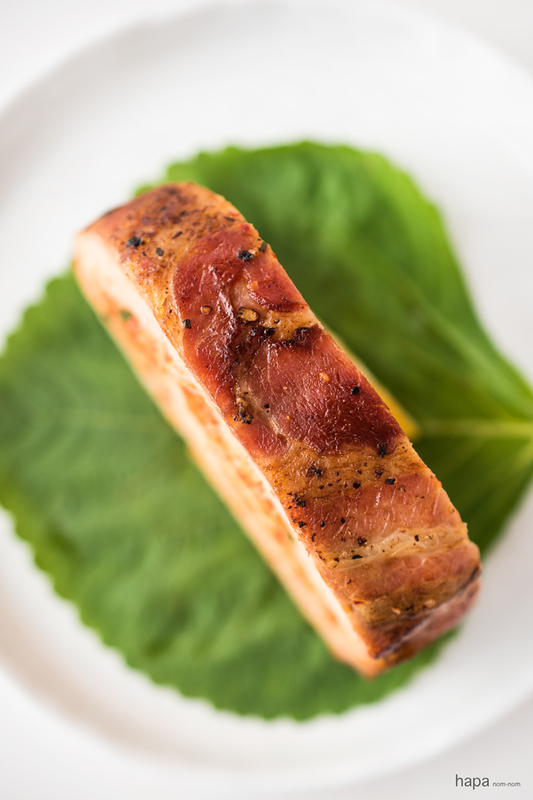 Except pork belly isn’t always easy to come by for everyone, and when you do find it, it’s generally cut into strips. So I decided to go with a pork tenderloin instead – something that can be found at any grocery store. To add some fat/flavor to the tenderloin, I wrapped the roulade in pancetta. 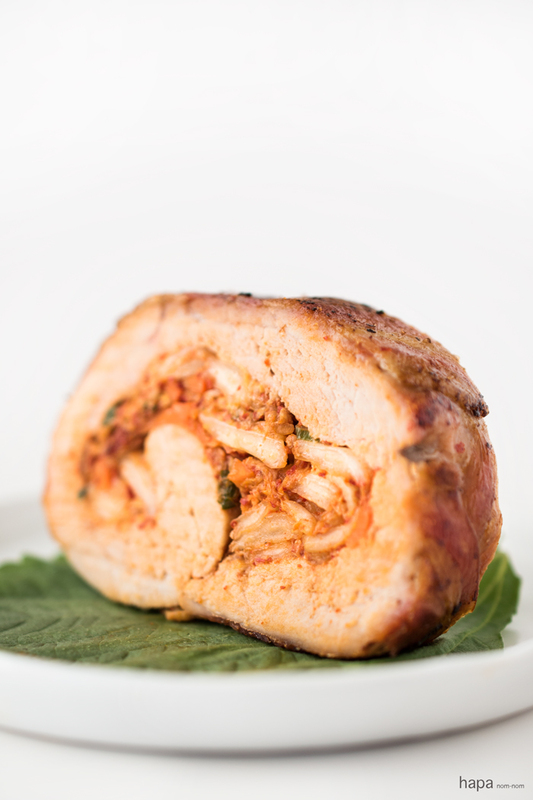 The result, Pancetta-Wrapped Kimchi Pork Roulade – it’s like Korean BBQ wrapped into one incredible fusion dish! To make the Kimchi, place the sliced Napa Cabbage into a large bowl. Add enough water to cover the cabbage and add the salt, stir to combine. Let sit for 10 minutes. Combine the remaining ingredients of the quick kimchi in a smaller bowl to make a paste. Rinse the salted cabbage well and pat dry. Add the paste to the sliced cabbage and mix well with your hands (I like to wear food safe gloves). Store the mixture in a jar or plastic container. Press the contents down to protect the kimchi from being exposed to too much air and cover. You may use the kimchi right away, or you can keep it at room temperature to ferment for a few of days – the flavor will intensify if allowed to ferment. Preheat the oven to 400 degrees F. And prepare a sheet pan by lining it with foil. Place the butterflied pork between two sheets of plastic wrap and pound with a kitchen mallet to ¼-inch even thickness. Spread the kimchi in a ½-inch thick layer over the meat, leaving a ½-inch boarder on all sides. (You'll have extra kimchi leftover. You can either make another roulade, serve it as a side, or save it to enjoy later). Starting at the narrowest end, roll the pork up like a jelly roll. Then wrap the roulade all the way around with the pancetta. Secure tightly with kitchen twine, being sure to secure the underside and the ends, per this great video tutorial, here. Season the entire roulade liberally with salt and pepper. Place the roulade on the prepared sheet pan and roast for 30 minutes. If you feel that the pancetta isn't browned/crispy enough, simply heat a large skillet over high heat and add a tablespoon of vegetable oil. Sear the the roulade on each side until golden-brown and crispy (about 30 seconds, per side). Allow the roulade to rest for 5 minutes before slicing. In a small bowl, combine the ingredients for the dipping sauce. Remove the twine from the roulade and slice.Serve with the sesame leaves (optional) and the dipping sauce. Enjoy! * You can ask the butcher at any grocery store to butterfly this for you, just tell them you're making a roulade. Otherwise, you can easily do this at home. Simply slice the roulade, lengthwise, making sure not to cut it all the way through - you want to slice it so it opens like a book. Check out this video here. ** Perilla/Sesame leaves have a grassy, somewhat bitter taste that is served with Korean BBQ. They can be found at any Korean grocery store and most general Asian grocery stores. I am both terrified and in love with the Korean spa! The body scrub is certainly ‘an event’, but you’re skin feels like silk afterward! Omg!! This is genius. I can almost taste it. Woot! Miss you tons. Xoxo. That looks fantastic. I’ve never had Korean BBQ before… I was actually just saying that to my husband the other day. I would love to try it in the not too distant future. Oh if you ever have the chance, give Korean BBQ a try! It… is… incredible! This dish incredible Kathleen! It’s so beautifully presented and I love the flavors going on here. It’s very interesting to learn a fast homemade kimchi recipe. We always buy a big jar and store it in the fridge, but I never realize it’s not very difficult to make. Thanks so much for sharing! Oh my…I’m a fan of anything wrapped in pancetta but this is exceptional. Thanks for sharing your story and the video – hilarious!! Your post has entertained on many levels!! Wow! Your spa day sounds indeed rejuvenating. I can go to spa everyday! 😉 This is such a delish recipe and pictures are stunning! Oh my!! You had me at pancetta-wrapped! lol This looks so yummy. I can just imagine all the flavor that’s packed in this. It’s also a great dish to lay out at a party with those beautiful slices. Fa-bu-lous, Kathleen! I’m totally checking out that Conan video because it sounds hilarious! There is nothing funny about this pork loin though! I can only imagine how delicious it is and I want to drink that dipping sauce with a straw! Kathleen, you are so creative to think of this recipe. I love it because I am obsessed with kimchi (and pancetta for that matter) and could eat it every day and mix it in everything. And it’s really good for you so I don’t care that I eat a lot of it. Yay to fermented foods! That video was hilarious! OMG, the clay sauna did look just like a pizza oven. That’s scary! LOL!! Bah-hahahahahaha! Seriously, Kathleen, I almost peed myself watching that YouTube video!!! I LOVE both Steven (YES walking dead) and Conan! That video was the funniest thing I have seen in a while. I totally saved it and I’m showing it to Boy when he gets home from work. Thanks for sharing that! I hope your spa experience wasn’t really like that – especially that scrub! OUCH! There is a Korean spa in Chicago, but I’ve never been there. 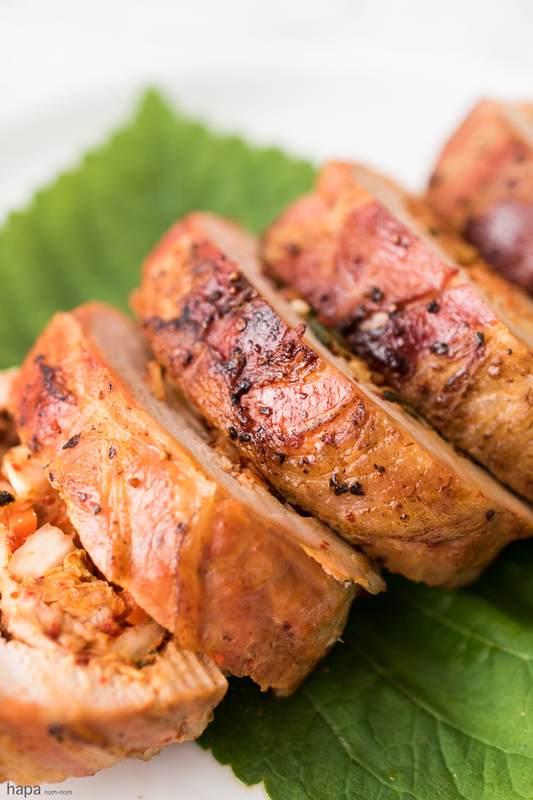 Love Korean BBQ and this pork roulade looks outstanding! Great recipe! Oh you should go! The body scrub is great – they do scrub you until you’re red, but your skin feels SO soft afterwards. Thanks for sharing the Conan video – he’s such a funny guy. And this is so creative, Kathleen! I’m smitten with kimchi and love the combination of flavors here. Looks so darn good. Omg, he’s hilarious! So glad you like the recipe and I love seeing all of your Paris photos!